Since 1979, Antiques Roadshow has thrilled television audiences with its unlikely subject: antiques. There is a special excitement in knowing that a family heirloom can hold great historical and monetary value. For many lovers of solid wood furniture, this instinct for history and antiquity is strong. Because who knows whether the hand-crafted furnishing of yesterday may become the treasured heirloom of tomorrow? Or, stated differently, Today’s Furnishing, Tomorrow’s Treasure: Rustic Furniture. 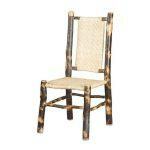 The Hickory Diner Chair with Cane Seat Back features natural bark accents. Perhaps no type of furniture sends out antique vibes like rustic furniture. And Amish artisans are on the forefront of crafting this unique type of furniture. Hickory wood is one of the most popular choices for rustic furniture. Also, Amish craftsmen love using natural pieces of hickory containing knots and bark to enhance the rustic appearance of the furniture. These natural accents add a custom touch to each furnishing. In fact, that’s the main reason no two pieces of rustic furniture are exactly alike. Of course, furniture aficionados love this one-of-a-kind, ‘natural,’ or ‘authentic’ look. With their skills in crafting custom hardwood furniture, Amish cabinetmakers offer some of the finest rustic furniture available today. And furniture lovers can see these pieces at Brandenberry Amish Furniture in Shipshewana, Indiana. The Hickory Loveseat is a great example of rustic furniture. So check out its knots and imperfections. Also, notice how the natural quality of the wood enhances the beauty of this piece. What’s more, the fine upholstery accentuates the settee’s appeal. Brandenberry offers several other fine examples of rustic furniture. Like the Hickory Diner Chair with Cane Seat and Back (shown). Another eye-catching piece of rustic furniture is the Hickory Bed. You can see these and other great pieces of hickory furniture online at Brandenberry’s website. Or, you can visit Brandenberry’s ‘brick and mortar’ store in Shipshewana, Indiana, and see these pieces in person. And here’s the fun part. You get to enjoy these fine pieces of rustic furniture today. And who knows? You may appear with them on TV at a future date to find out what their selling prices will be. Because Brandenberry is all about Today’s Furnishing, Tomorrow’s Treasure: Rustic Furniture.